Every few months Wet N Wild release a new collection. The latest offering comes in the form of a limited edition fall collection containing exquisite shades for autumn and winter. Think beautiful gold, rose gold, and bronzy brown shades. The accompanying lipsticks are matte and in deep berry shades. 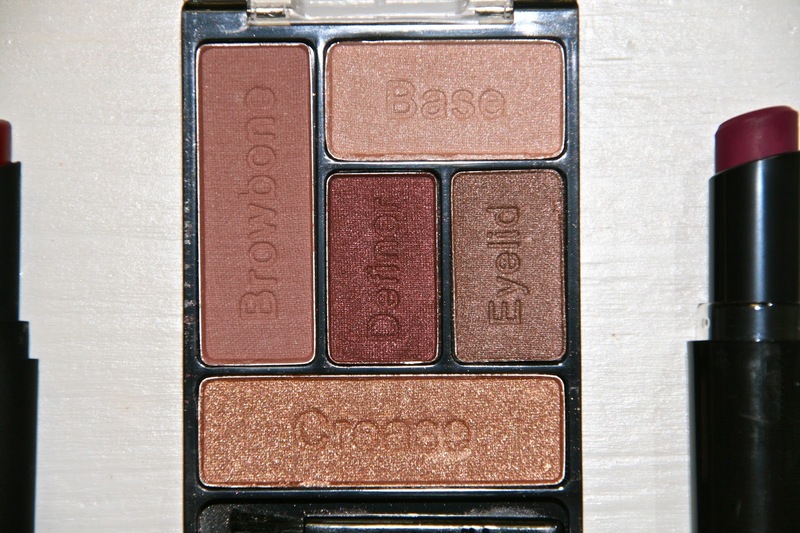 Eyeshadow palette in "Smoke and Melrose"
This eyeshadow palette contains five warm-toned neutral eyeshadows. 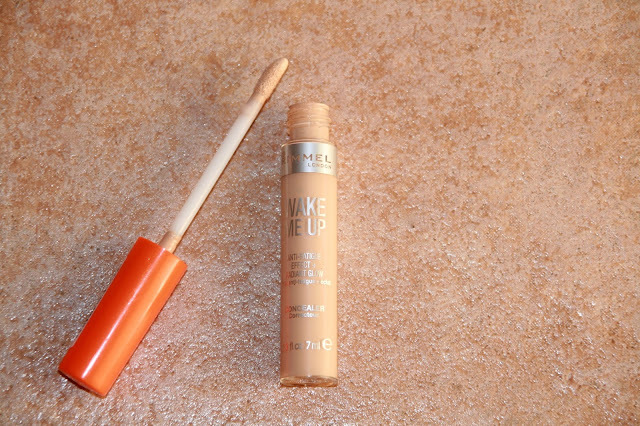 The shades are extremely wearable both day and night. The quality is what we've come to expect from Wet N Wild: buttery and blendable with little to no fallout and good staying power. There is one matte shade (brow bone), a dusky purple-pink, and the rest of the shades contain subtle shimmer. There is a pink shell colour (base), a beautiful taupe (eyelid), a shimmery gold crease shade, and a rich plum definer shade. This palette is fast becoming one of my favourites! Matte Lipsticks in "Urban Night" and "Sugar Plum Fairy"
I'm not normally one for bright lip colours, but this winter I've decided to dip my toe in the plummy pool. Part of the Fall collection is a deep red lipstick in the shade "Urban Night" (left). It has a creamy consistency and turns to a matte lipstick that feels comfortable on the lips. You can see swatches here. "Sugar Plum Fairy" is a permanent shade and also a matte lipstick. 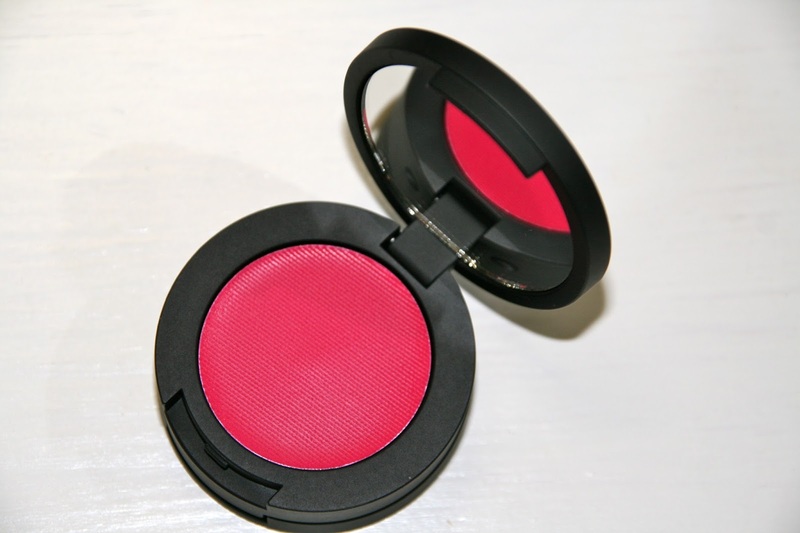 This shade is a perfect dupe for Mac Rebel. It also applies very nicely and settles into a comfortable stain. You can see some swatches here. Urban Night is a dark burgundy red and comes across more plummy than in the bullet. Sugar Plum Fairy is more purple and comes across more pink-purple than in the bullet. 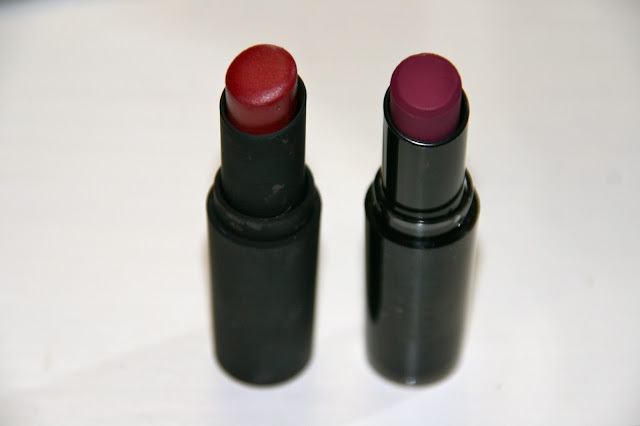 Both lipsticks are extremely long-lasting and although they are matte do not dry out my lips, which is no mean feat! I stand corrected, but I think these were R45 each, and I think they are extremely good value for money. Do you own any of these products? Let me know in the comments section! I have been using a few products from REN during the past year or so, and I really love the brand. My favourite products from them include the Glycolactic Radiance Renewal Mask as well as the Frankincense Night Cream. 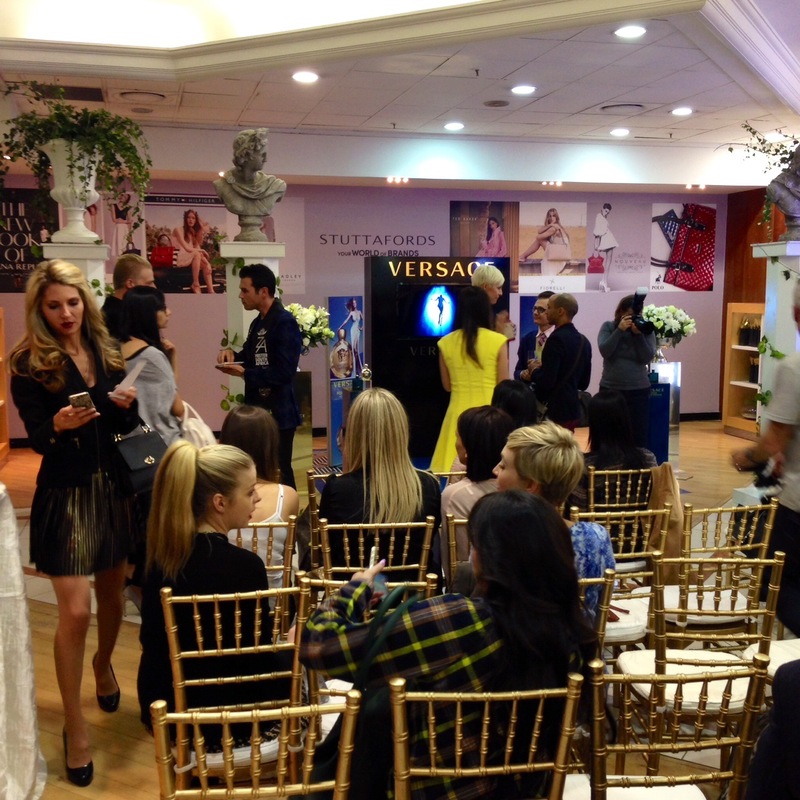 Today I'll be talking about two new products, one in the Rosa Centifolia range, and one in the Vita Mineral range. The Rosa Centifolia range is aimed at daily cleansing. There are seven products in the range, namely this Express Make-Up Remover, Cleansing Gel, Foaming Cleanser, Gentle Exfoliating Cleanser, No. 1 Purity Cleansing Balm, 3-in-1 Cleansing Water, and Hot Cloth Cleanser. The Express Make-Up Remover is a silky cream that comes in a pump dispenser. I love REN's packaging and this one also does not disappoint. It contains a blend of oils and flower water and is extremely gentle. It contains Rice Bran oil that soothes and hydrates the skin, and is especially good for people who tend to have dry or dehydrated skin. It also contains Rosa Centifolia Tannins for reducing the pore size, although I can't comment on the size of my pores around my eyes! 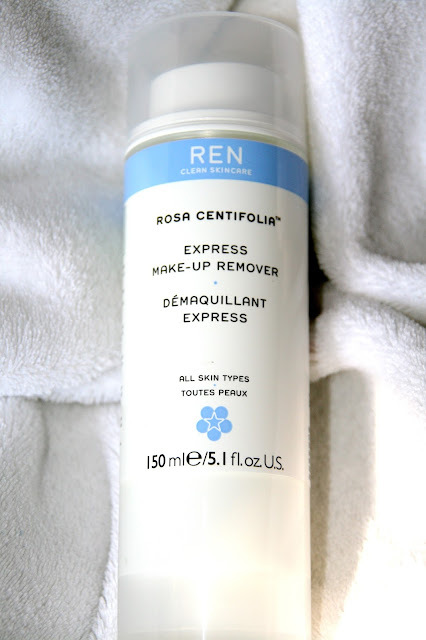 The makeup remover has a creamy texture and the softest barely-there rose fragrance. I pump a small amount on two cotton pads and press the cotton pads on my closed eyelids for about fifteen seconds. I then move the cotton pads in gentle circular motions across my eyelids to remove my eye makeup. I struggle to remove my waterproof mascara completely with one cotton pad, but for removing eyeliner and eyeshadow it works a treat. I have sensitive eyes and this did not irritate my eyes at all. My eyes also didn't feel dry after using this, they actually felt nice and hydrated. A 150 ml bottle costs R330 and you can purchase it at stores selling REN, or from their website here. The Vita Mineral range is aimed at daily nourishing of the skin. Other products in this range include Active 7 Radiant Eye Gel, Daily Supplement Moisturizing Cream, Emollient Rescue Cream, and Omega 3 Optimum Skin Serum Oil. This lip balm is the newest of the two products I'm featuring today, as the official release date was only last week. The lip balm is a deeply nourishing lip balm that repairs, soothes, and protects dry or chapped lips. It contains Propolis from Acacia honey and Caldendula to help soothe irritation, as well as Vitamin E to reduce UV induced damage. The Shea and Cocoa butters replenish and repair lips. The lip balm comes in a squeezy tube with a slanted tip for applying the balm to the lips. It has a thickish consistency and smells *exactly* like REN's Glycolactic Radiance Renewal Mask! I haven't tried applying it under or over lipstick, as I prefer using it on its own. The thick consistency feels really nourishing on the lips, yet it doesn't feel greasy or waxy. It has really helped my frustratingly dry lips during the transition from autumn to winter. 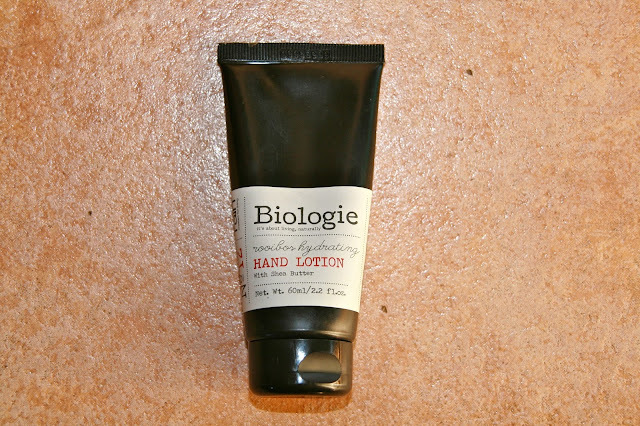 This 15 ml tube retails for R150 and is available in-store and, I believe, online. 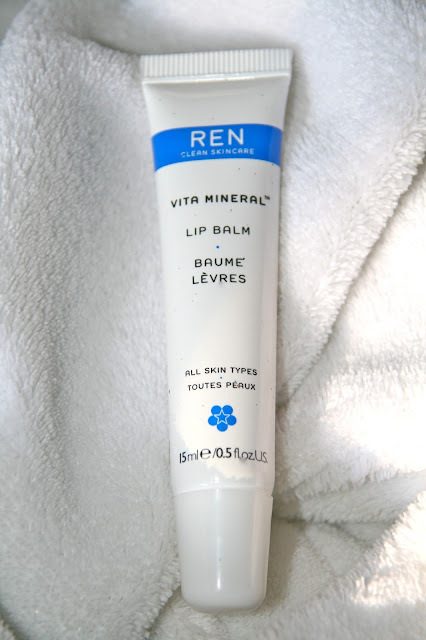 Have you ever tried any REN products? Which were your favourites? Let me know in the comment section. I hate it when bloggers buy three items (or less!) and call it a haul, but I didn't know what else to name my post, so bear with me! I recently heard from various bloggers that Topshop has decided to relaunch their makeup range and I for one couldn't be happier. I went to have a look last weekend, and this is what I came home with. I have seen this featured on Anna's blog and it looked so cool that I just had to get it. 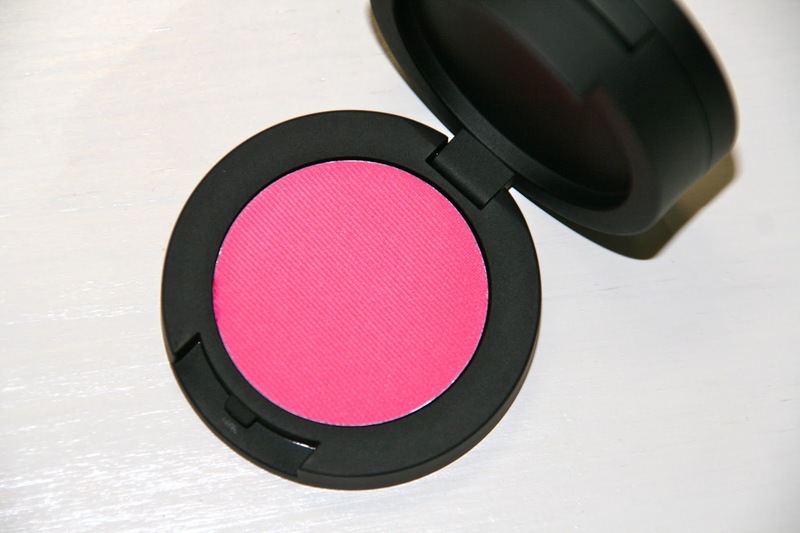 It looks like a small, but thick, blush compact. When you open the top compartment, there is a mirror in the lid, and a pan of dark pink lip cream. When you open the bottom lid, there is a pan of bright pink lip cream. The idea is that you apply the dark pink lip cream to your lips with a brush (which they sell separately, obviously), and then you dab the light pink shade on the middle of your lips and blend it slightly outwards to create an ombré effect. Below you can see it in action. Nail Polish in "Blue Rinse"
This is another ViviAnnaDoesMakeup enablement. I already own a couple of shades that resembles this one, but I mean, you can never have enough cornflower blue polishes, am I right? "Blue rinse" is a gorgeous pale periwinkle/cornflower blue. I haven't worn this yet, but Topshop nail polishes are normally very creamy and long lasting, so I can't wait to paint this on. 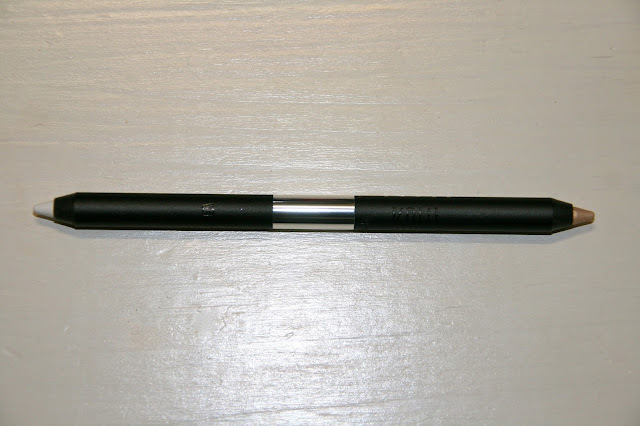 This double-sided eyeliner pencil contains two colours to wake up the eyes. The one end is an opaque white, while the other end is a pale gold/champagne colour. I haven't really tested this out yet, but twice now I have swatched it on my hand, and five minutes later I couldn't get it off. I even struggled to get it off with Bioderma, so I have high hopes for this. 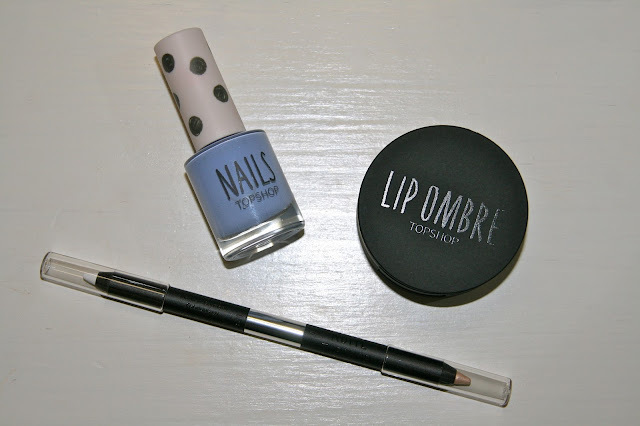 Do you have any Topshop makeup favourites? Enable me! The June Test Box - Stay Vibrant! Another month, another Test Box offering! It seems like The Test Box's subscription boxes keep getting better with each month, and this month is a real goodie. 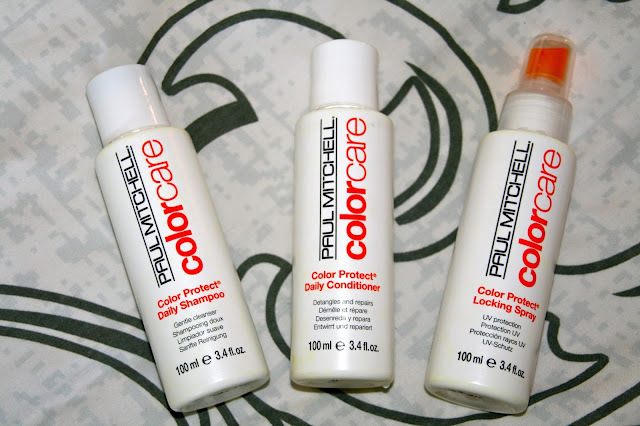 It is aimed at colour-treated hair and is just what my ombré hair needs! This shampoo cleanses and moisturises colour-treated hair while strengthening it and boosting shine. It contains sunflower extract that provides intense UV protection, and conditioning agents adds shine and hydration. It helps your colour last longer by protecting it from the sun. Apply, massage, rinse, you know the deal! I like this shampoo because it is very gentle and I can wash my hair every day without worrying about "washing out" my colour. It has a soft and gentle fragrance, and I love the fact that the shampoo and conditioner have different coloured caps (the part that flips open on top) so that you can distinguish them in the shower! The conditioner detangles and smoothes colour-treated hair. Hair is left looking and feeling soft and hydrated. Sunflower extract protect hair from sun damage, while conditioning agents boost shine and moisturises your tresses. It provides UVA and UVB protection and helps prevent colour from fading. Apply after washing hair, massage, and rinse out. This conditioner is also very mild and gentle with a soft floral fragrance. The 100 ml bottles are also the perfect size for travelling, which is an added bonus for me. The locking spray makes hair look conditioned and super shiny while locking in and extending the life of hair colour. As with the other two products, sunflower extract and conditioning agents hydrate the hair and keep the colour from fading. I was most intrigued by this product. It smells exactly the same as the other two products, maybe a little bit stronger. The pump produces a nice powerful mist, without squirting out streams of product. I use it on towel dry hair before I blow dry it. I can't comment on its effectiveness, but it does a very good job of detangling my hair. 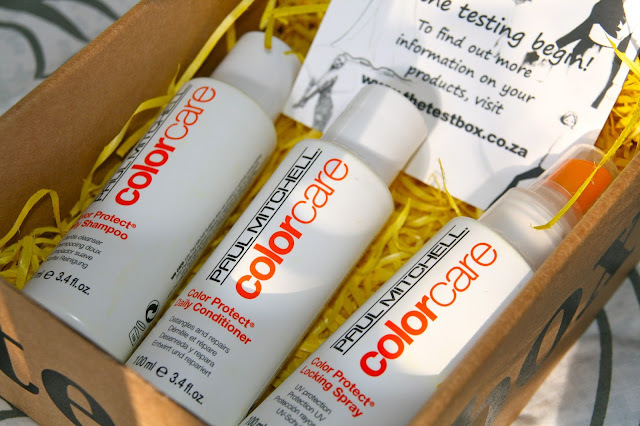 For R160 this Test Box can be yours (300 ml of Paul Mitchell products!). Head on over to The Test Box to sign up and order a box before it's sold out! They are also offering a discount on all Paul Mitchell products for the month of June, just enter the code StayVibrant upon checkout. One of the perks of being a beauty blogger is that you get invited to launches of new and exciting products. Two weeks ago I was lucky enough to attend the launch of the new Versace Eros perfume at Stuttafords in Sandton City. There were numerous local celebrities, including singer Loyiso Bala, and TV and radio personality Liezel van der Westhuizen, amongst others. Champagne flowed and finger food was nibbled, while everyone greeted their friends and were introduced to new acquaintances. 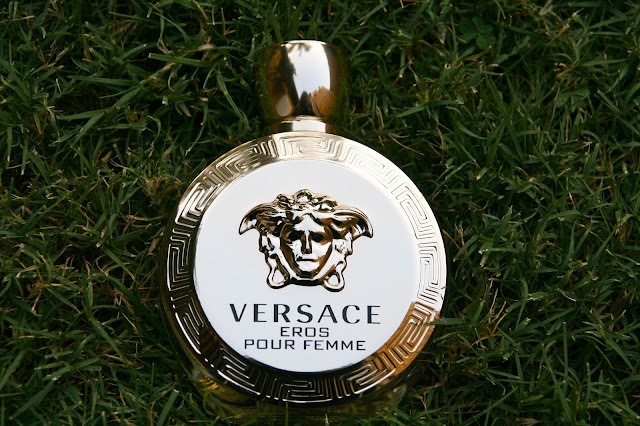 The presentation on the new Versace Eros Pour Femme perfume was short and sweet, with just the right amount of detail and storytelling. I love Greek mythology, so I was excited to learn that Greek mythology was the basis for this perfume. In Greek mythology, Eros was the god of love, and this ties in closely with the seductive and sensual fragrance. According to Versace's website, this new perfume is "...a new legend from Versace, bursting with the passion of when Eros meets his true love, Pour Femme." Versace Eros Pour Femme is for the strong, passionate, and mythical woman. It's a floral and addictive fragrance, and is part of the floral, woody, and musk family. It contains notes of Sicilian lemon, Calabrian bergamot, pomegranate, lemon flower, jasmine, peony, sandalwood, musk, and sensual woods. To me it almost smells like magnolias, and I've worn it every single day since that night. I spray it on before I leave the house in the mornings, and by 20:00 I can still smell it. The bottle is just as exquisite and opulent as the fragrance: a gold glass bottle with the most beautiful golden embossing. 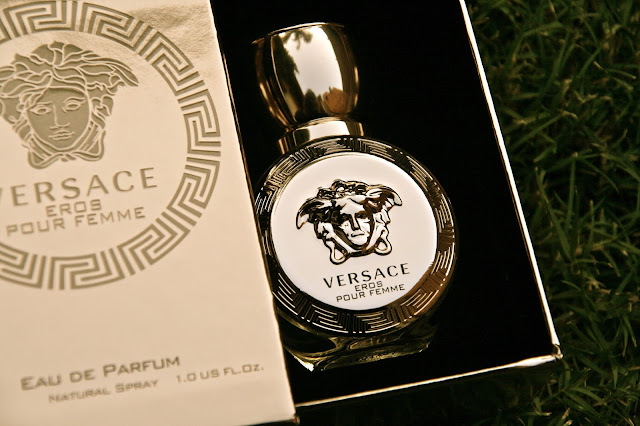 Perfume (and packaging) fit for a Greek goddess! 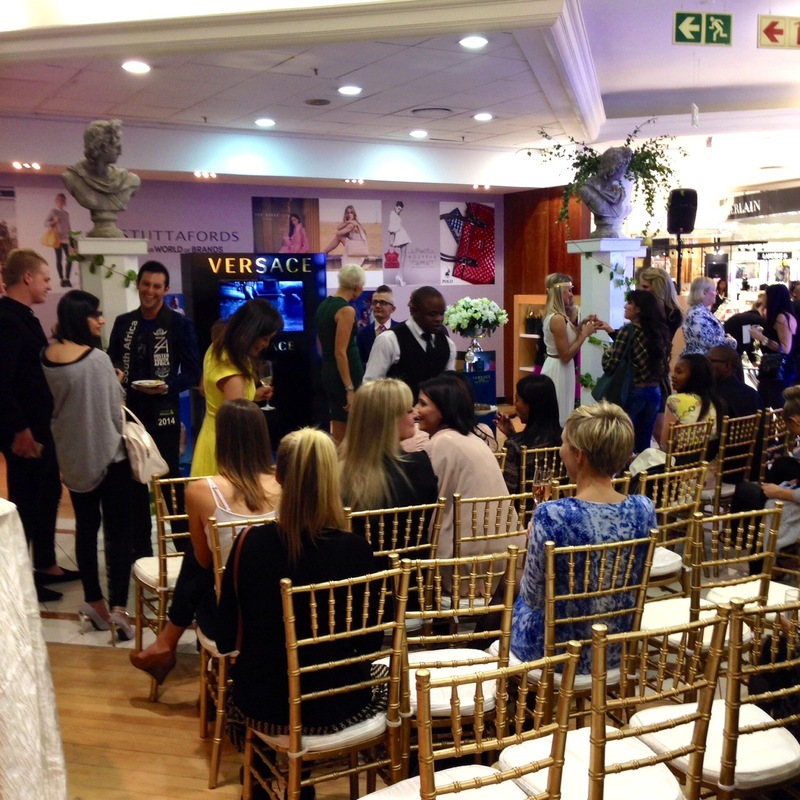 There was a competition where you could win prizes for sending the most tweets using the #fragrancestuttafords hashtag. 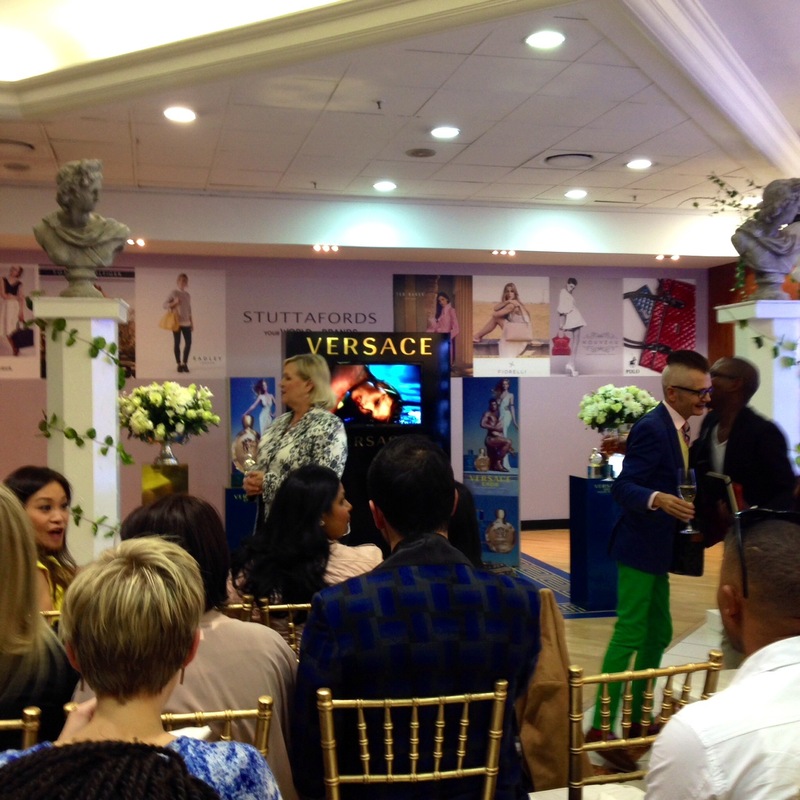 I was shocked to learn that I had won third place, which was a humongous 100 ml bottle of Versace Eros! 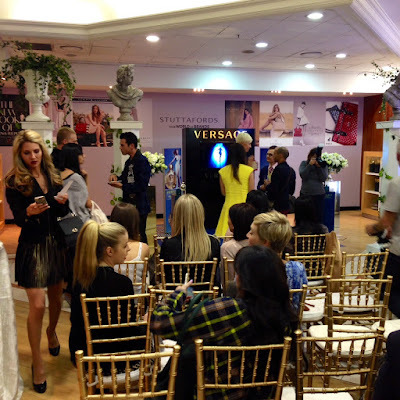 Thank you to the lovely people at Stuttafords for having me and for making me smell like a million bucks. 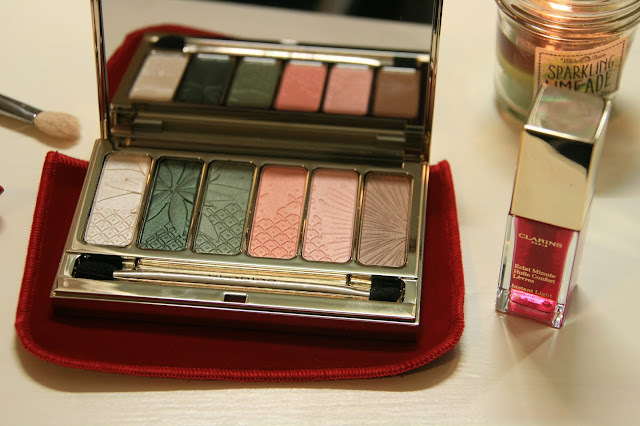 Clarins launched their new collection called "Garden Escape" in the middle of May. I have read many a review about this collection and although everyone reviews the same products, I can't seem to get enough of all the different views! Today I'll be telling you about two of the products that I purchased, and my thoughts on them. The Garden Escape collection consists of the six-colour eyeshadow palette (limited edition), two lip oils (honey and raspberry of which raspberry is limited edition), two new shades of their Joli Rouge Brilliant lipsticks, a new Blush Prodige shade, a new Crayon Kohl Eye Pencil, and six brand new Instant Light Natural Lip Perfector Balms (the balm version of the beloved Lip Perfectors in the tubes). For descriptions and prices on all the different items, head on over to the Clarins SA website. If you're a sucker for packaging, then you'll fall in love with this palette. The eyeshadow palette looks like one of those classy cigaret cases that made smoking look so damn cool in all the old movies. It's solid and sturdy and has the most beautiful pattern embossed on the lid. I could really just stare at it for hours! 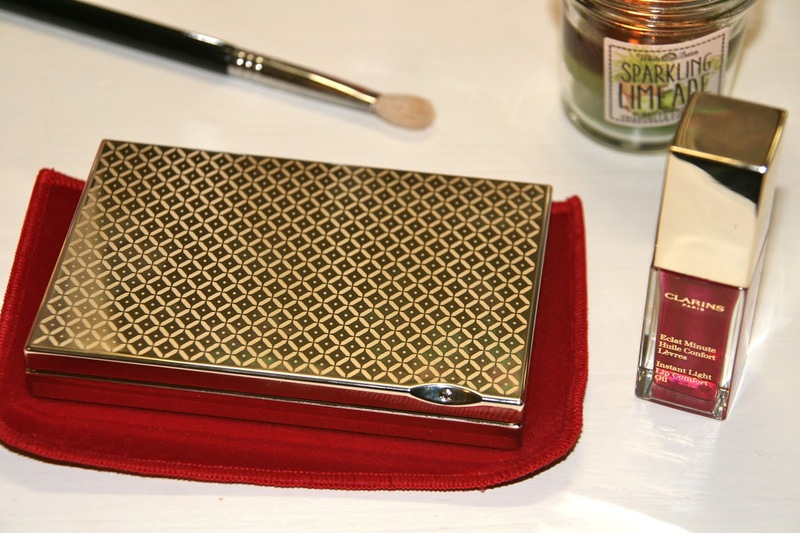 The palette also comes in the signature Clarins red velvet pouch, adding to the swoon-factor. According to the website, "Clarins pays homage to sunny days with a harmony of long-lasting and smoothing satin and pearly eyeshadows. A flower decorates the palette in reference to the freshness of the six shades." 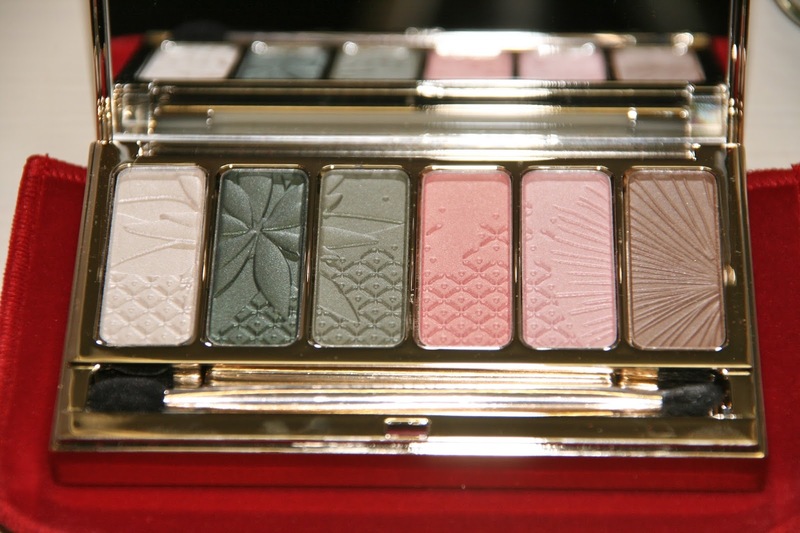 The inside of the palette is even more beautiful. The entire lid is a mirror, and the six eyeshadows are nice and big. There is also a delicate floral pattern embossed on the eyeshadows, and I'm currently trying to keep my brush away from the delicate pattern. From left to right the shades are frosty white, dark mossy green, light khaki green, medium pink, light pink, and a chocolate-ice-cream taupe. The eyeshadows are the weirdest texture that I've ever used. They are buttery and creamy, but in a way totally different to what I'm used to in eyeshadows. It's almost like you're putting light butter cream on your eyelids! 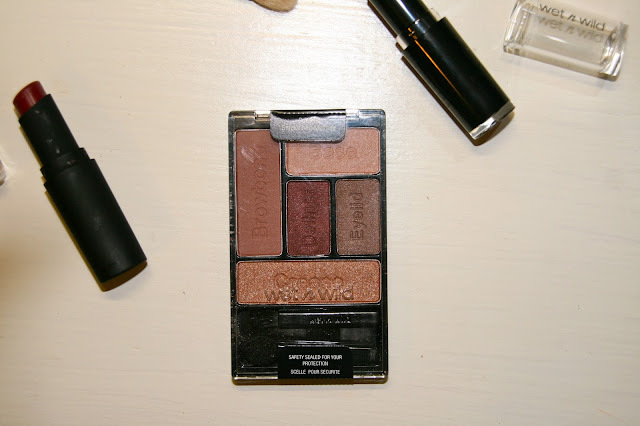 The eyeshadows apply beautifully and are so vibrant, but I find that they don't blend together very easily. I use the "cheat sheet" card included and apply the eyeshadows as indicated (without overlapping the shades), and then I blend like crazy. Most people are scared of the green eyeshadows, and at first I was too, but all the shades just work so well together. All the shade choices have been thought out carefully and can be combined to create beautiful eye looks. This is the other limited edition item in the collection and probably the one that created the most buzz. We have heard about oils for cleansing, for moisturising hair, face, body, nails, you name it, but lips?! I had it in my head that this was going to be, well, an oil, and that it was going to sink into my lips and that would be that. This lip oil feels much more like a lipgloss than a lip oil. It smoothes into your lips beautifully with the fat doe foot applicator that should rather be called a "cat foot" applicator. You kind of just want to sit there and apply lip oil to your lips for half an hour! It adds a glossy finish to your lips and it makes you feel like there's a barrier between your dry lips and the harsh cold outside. That being said, it's not gloopy or sticky at all. It's the perfect balance between a gloss and an oil. It also doesn't leave my lips chapped and flakey like so many other "lip saviours" tend to do. It sits comfortably on your lips and after a few hours you can feel it sinking in. 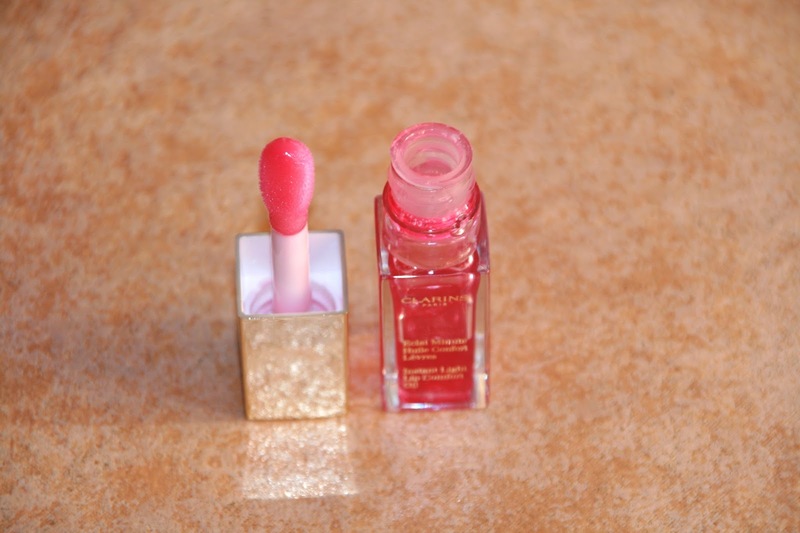 You can apply some more oil on top without obtaining that usual disgusting look when you re-apply lipstick or lipgloss. 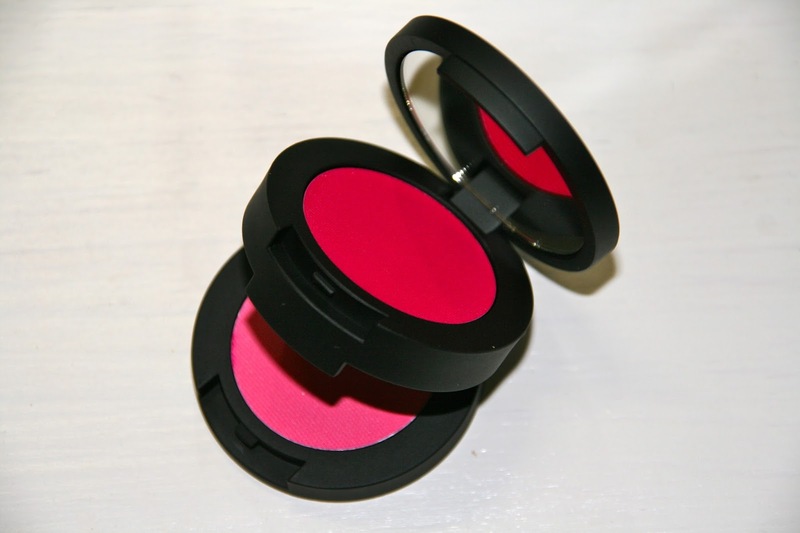 Next on my list is the blush and one of the lip perfector balms. Have you tried any of these yet? Let me know in the comments section. I know everyone always says how the time flies, but my goodness, we're done with the fifth month of the year! 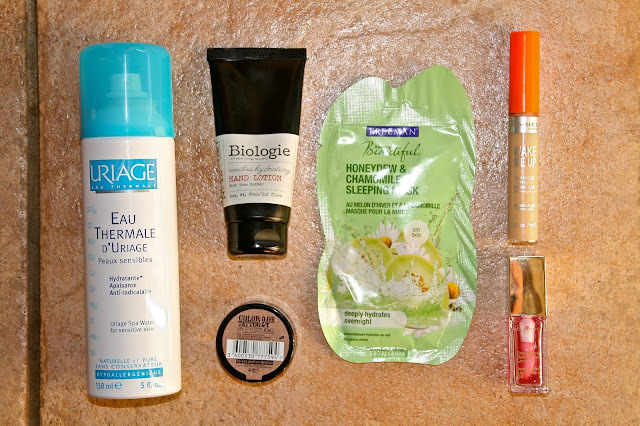 This month felt incredibly short and I really had to think which products to include in my favourites post as there were so many that I enjoyed. I bought this big can of thermal water a long time ago and for some or other reason it went missing at the back of the cupboard, as things sometimes tend to do. For the past month I've been using this as a toner at night and I'm really enjoying it. It's almost salty, but I suppose that's the zinc content in the spray. 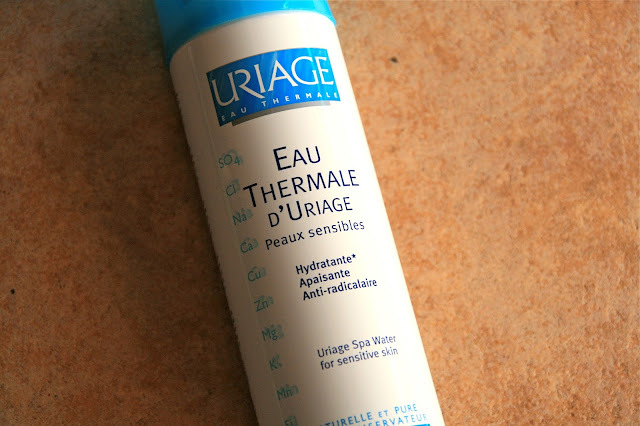 Thermal water is very good for your skin as it contains minerals and nutrients that replenish your skin's minerals and definitely won't dehydrate your skin. It's a great product for when your skin is very red or just generally sensitive. My skin gets a bit sensitive during winter as it's extremely dry in Gauteng. My skin is also very red after I've cleansed it, and I find this to be quite soothing. You can buy this from Clicks and Dischem. I am addicted to face masks, and I have quite a few of the Freeman masks. 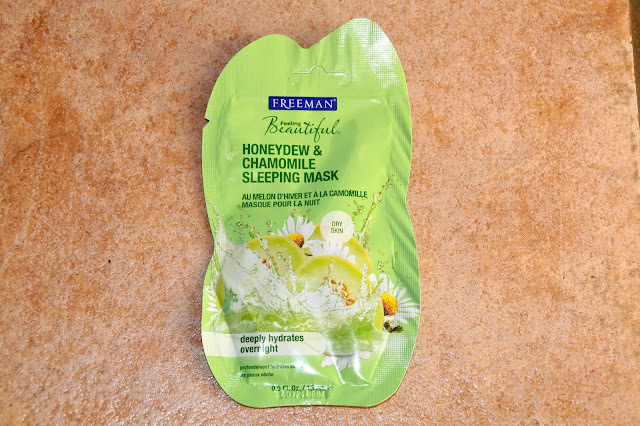 This mask unfortunately only comes in sachets and not in big tubes like most of the others. For R16.95 at Dischem you get quite a few applications from this sachet. This is my second sachet, but I'm still busy with my first one. It's a creamy mask, but doesn't feel heavy or sticky on the skin. I cleanse my face at night and then apply all my other goodies (serum, oil, night cream), before putting this on as sort of a "final barrier" for the night. The smell can be a bit overwhelming for some people, but I personally love it and find it very comforting. It smells like sweet melon and I just love slapping this on my face, especially since I wake up the next morning with plump and soft skin. This was sent to me quite a while ago (I reviewed a few Rain Africa products here), and although I enjoyed using it at the time, this also got moved to the back of the hand cream pile. I've been using it now for the past month or so and I have sadly used it up last week. This should be a testament to how much I enjoyed using it! It's not a thick and greasy lotion, it's quite lightweight, and although the lightness bothered me when I first used it, I felt it suited me better this time. The smell is also amazing (Rooibos and vanilla, yum!) and I used it every night before going to bed. 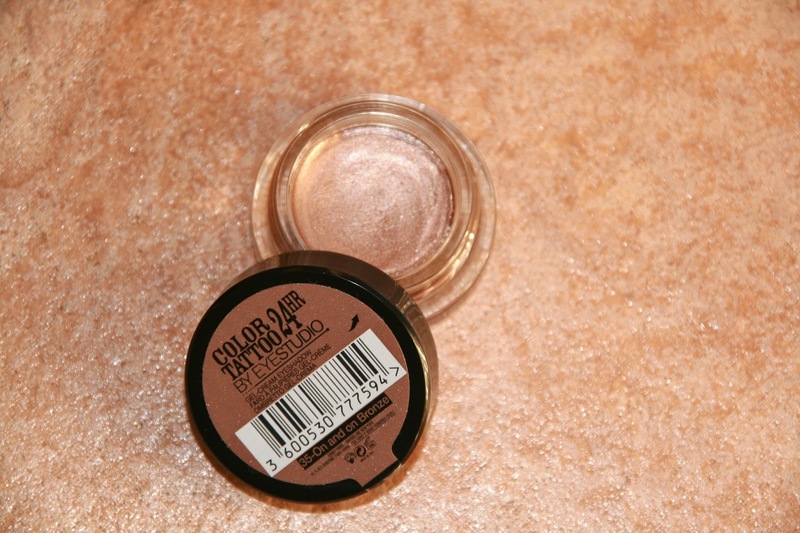 Maybelline 24hr Color Tattoo in "On and On Bronze"
For years now I have heard from international bloggers, as well as local bloggers, about this fabulous cream eyeshadow. For a while we did get the Maybelline Color Tattoo cream eyeshadows in South Africa, but I haven't seen them in months. This shade called "On and on bronze" also sadly never reached our shores. In January I put in an order at Feel Unique for this as well as a few other bit and bobs. This reminds me a lot of the MAC Paint Pots, although it is about half the price (even when shipping it from overseas). The texture is creamy and the colour, as you can see, is a beautiful golden-bronzy colour. 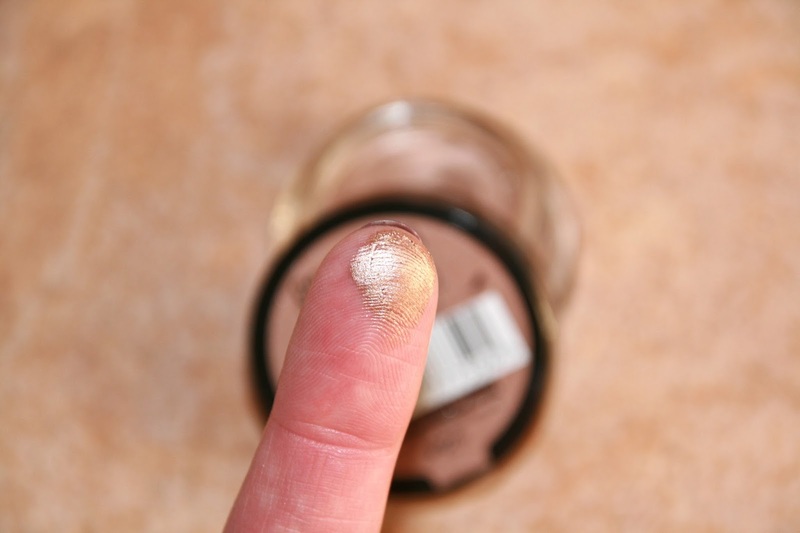 I apply this with my finger and blend the edges out with a fluffy brush. 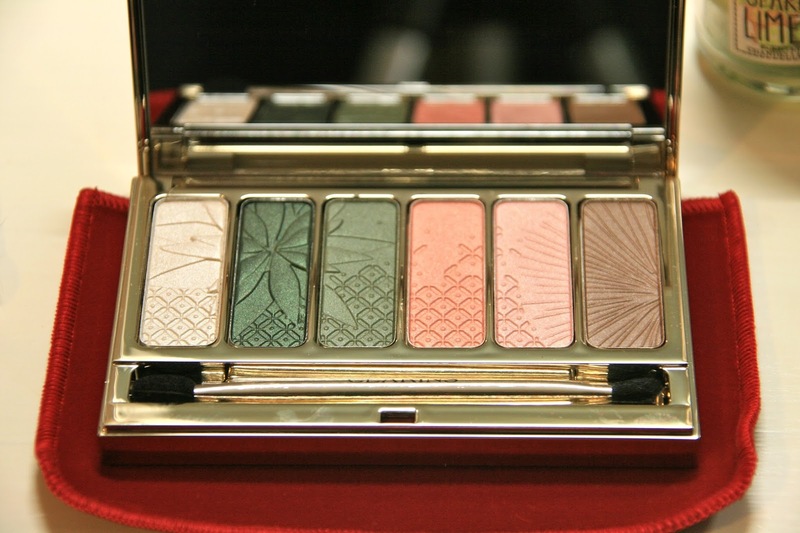 It looks amazing on its own or pared with another neutral eyeshadow. 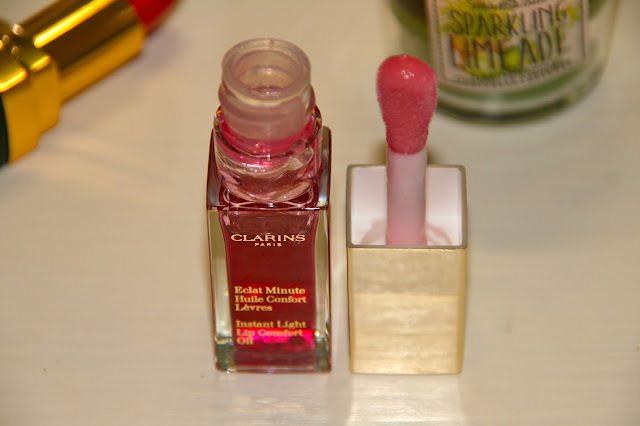 Clarins Instant Light Comfort Lip Oil in "02 Raspberry"
Clarins recently released their latest collection called "Garden Escape". When it came out I was on that collection like a rash! I had already earmarked a couple of products to purchase, but decided to go with the limited edition ones first, as they would obviously sell out first. I bought the beautiful eyeshadow palette (more on that in an upcoming post), as well as this Instant Light Lip Comfort Oil in "02 Raspberry". I don't know why, but I thought the texture would be, well, oily, but it's not. It has the consistency and texture of a lipgloss, but your lips never feel sticky or dry. You can feel the oil nourishing your lips, and after a few hours it just kind of sinks in. A bonus is that it smells absolutely delicious (there is a honey one too, I can just imagine how good that smells! ), and that it leaves your lips with a nice glossy finish. The applicator is also super cute: it's a big and wide doe foot applicator, but as someone else said, it feels like a kitten's paw touching your lips. Rimmel Wake Me Up Concealer in "030 Classic Beige"
This was another of the "bits and bobs" included in my Feel Unique order. I've heard a lot of bloggers rave about this and I have to admit, I really like it. The shade is a good match for me (I guessed the shade!) and I use it for under my eyes as well as on blemishes. 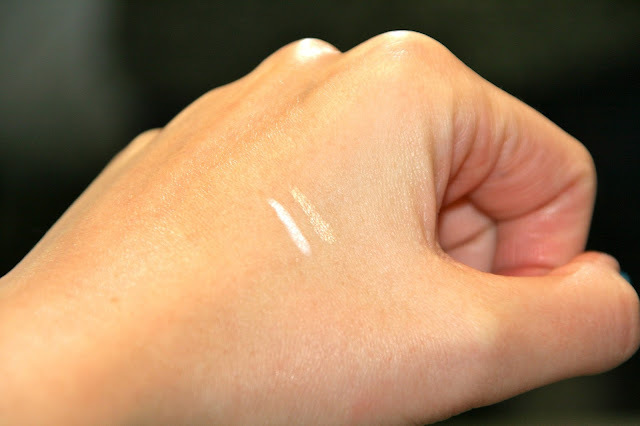 It's creamy and doesn't cake or settle into the fine lines under my eyes like so many other concealers do. I like that the texture isn't too thick and neither too watery, it's pretty much perfect. Non-beauty favourite: Mainstays candle in "Black Cherry"
My last May favourite comes in the form of a candle. A friend recently told me that Makro of all places sell these huge candles for between R80 and R100 (I think it was on special for R80 at the beginning of the month). There are many different scents but the husband and I (he helped choose) settled on Black Cherry, Cinnamon, and Balsam & Berries. I have only lighted the black cherry one, and it smells delicious! It doesn't smoke up your house, and the scent isn't sickly and overpowering. 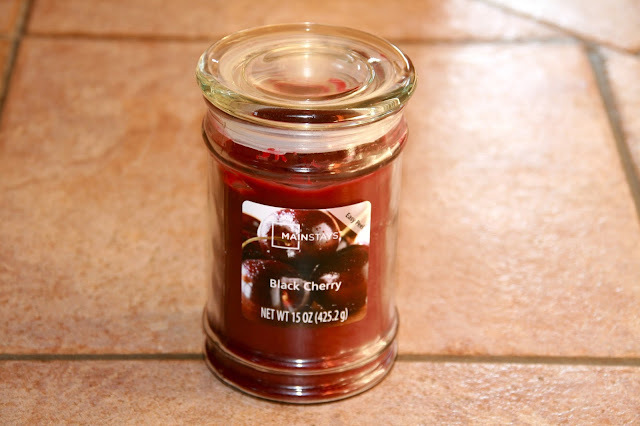 It just fills your home with a delicious black cherry scent. I can't wait to light the rest of the candles! What was your favourite product of the past month? Let me know in the comment section!